Nelson Rolihlahla Mandela was a South African politician and revolutionary who actively fought against the practice of Apartheid. During his political career, he has also served as the President of South Africa for a term. He is also the first black person to have assumed office and after the end of the apartheid era. Nelson Mandela joined the African National Congress in his youth and founded the Youth League. He was inspired by the Marxist ideology and also founded 'Umkhonto we Sizwe' an anti-government militant organization. Mandela has served long terms in jail for his acts against the government. Nelson Mandela's story is similar to that of Mahatma Gandhi as both the revolutionaries were lawyers in their early days and both of them led people to fight against racial discrimination and equal rights for all. On the lines of Gandhi, Nelson Mandela is often called "Madiba" or 'Father of the Nation', in his native country. Nelson Mandela was bestowed upon the Nobel Peace Prize in 1993, along with former South African state head F. W. de Klerk. Nelson Mandela was born in Madiba clan of Eastern Cape province of South Africa on 18 July 1918. Nelson's father Gadla Henry Mphakanyiswa Mandela used to counsel the monarch but was however discharged from duty on charges of corruption. Nelson's father had 3 wives other than Nelson's mother and thus Nelson had many half-siblings. Mandela belonged to the royal family of Thembu. Nelson used to go to the local missionary school for doing prayers and preliminary education. Nelson Mandela attended the University of Fort Hare, in East Cape to pursue B.A degree but could not complete it as he was barred from university for boycotting the low-quality food served there. Mandela earlier believed that Britishers were not exploiting them but rather providing them quality of life and have brought education and better medical facilities to the country. He however grew less fond of the notion when he realized that the discrimination had more to do with racial profile of people rather than their class differences. In 1940, Nelson moved to Johannesburg and did quite a few temporary jobs there. He managed to complete his B.A. degree as well. Nelson Mandela enrolled in University of the Witwatersrand (Johannesburg) to pursue LLB but could not complete it. Mandela joined the African National Congress in 1944 and later became the President of its Youth wing. Under his leadershiP, the ANC adopted a Toughened policy, the Programme of Action, in 1949. A joint civil disobedience movement was run with help from South African Indian Congress. Mandela was jailed for a brief term. Nelson Mandela had a diploma in Law, which helped him take up Legal practice. He along with Oliver Tambo set up a law firm, Mandela & Tambo, the first Law firm to have Black practitioners. Mandela and many other ANC members were accused of treason and conspiring against the State. They were arrested and prosecuted in 1956. A new order 'Pass Law' was forced on the natives and other non-Caucasian minority. The law required people to carry a passbook or internal passport in order to identify themselves, while roaming outside. People protested against it and in one such incident the Police opened fired on the protestors in Sharpeville, killing 69 people and injuring lot many. In view of the killing of dozens of unarmed protesting people, emergency was declared in the State and ANC was banned. In 1961, Mandela was released from the prison. Nelson Mandela left South Africa in January 1962 and came back in July of the same year. While in exile, he sent the word around and garnered support for his cause. He underwent armed training in Ethiopia and Morocco. As he was banned from leaving the city for five years and went out of the country without permission or notifying the authorities, he was sentenced five years of imprisonment. He was transferred to Robben Island in May 1963. In October, while Mandela was still serving the older sentence, he was put under trial at Rivonia on charges of sabotage. Though he was to be given capital punishment, after the conviction, Nelson and seven others were sentenced to life imprisonment. In 1982, Mandela was taken to Pollsmoor Prison in Cape Town for a period of 3 years. Nelson Mandela was diagnosed with tuberculosis in 1988. 14 months later, on 11 February 1990, he was released from prison. His old friend Oliver Tambo, who was serving as the President of the ANC, vacated his position, in view of his failing health. Nelson Mandela was appointed the President of ANC. In the first free-elections of 1994, Nelson Mandela was elected President, by method of voting. He was the first Black President of the Democratic nation of South Africa. Leaders from across the globe attended his oath ceremony. 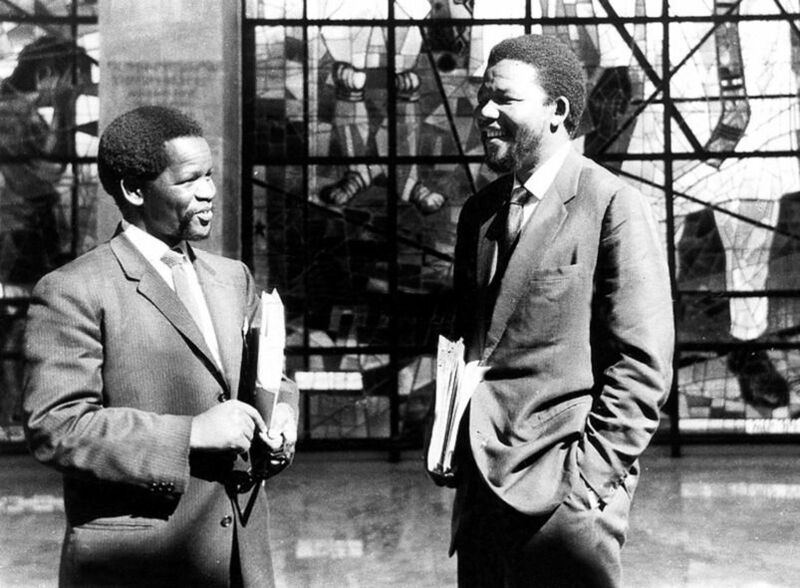 As the ANC had no experience of running a Government, Nelson was constantly counselled by his deputy Thabo Mbeki. Nelson lived simply and donated most of his salary to Nelson Mandela Children's Fund, a fund he founded in 1995. Mandela decided not to run for another term. In 1944 Nelson Mandela married a nurse and ANC activist Evelyn Mase. He had two sons and two daughters with her. The couple divorced in 1958. The same year, during the Treason Trial, Mandela married Winnie Madikizela, a social worker. The two had two daughters together and the marriage lasted until 1996. He got married, a third time in 1998, to Graça Machel. 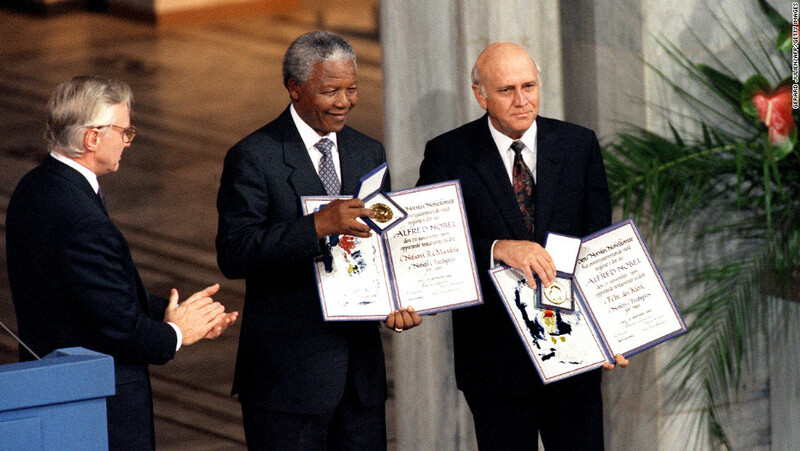 Nelson and former President FW de Klerk jointly won the Nobel Peace Prize in 1993. Nelson Mandela passed away at his home in Johannesburg on 5 December 2013. ➯ Nelson Mandela was awarded over 250 awards and titles in his lifetime. ➯ Nelson Mandela was given the Honorary citizenship by cities of Rome and Olympia. ➯ Nelson Mandela was conferred with Bharat Ratna, India's highest civilian award, in October 1990. ➯ In 1983, Nelson Mandela was awarded Honorary Doctorate of Laws by Lancaster University, United Kingdom. ➯ A Statue of Nelson Mandela was erected in London by London's Council, in October 1985. ➯ Nelson Mandela was given International Peace and Freedom Award by Workers International Centre (Sweden). ➯ Nelson Mandela was honored with the Cross of St. Andrew by Scotland in 1986. ➯ In the same year, Nelson Mandela was given Honorary Doctor of Literature by University of Calcutta. 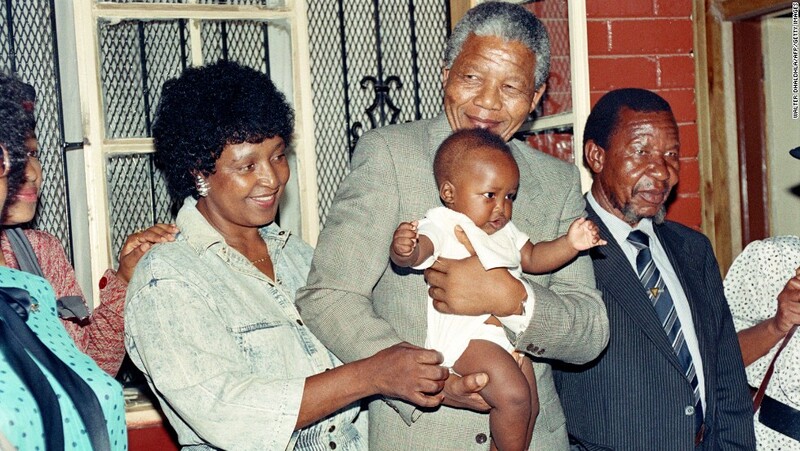 ➯ Nelson Mandela was the first person to be given the Freedom of the City of Sydney, in 1987. ➯ Nelson Mandela was awarded the Nobel Peace Prize in 1993 at Oslo, Norway. ➯ The same year Nelson Mandela was named as the Person of the Year by Time magazine, along with three other dignitaries. ➯ Nelson Mandela was a revolutionary and former President of South Africa. ➯ Nelson Mandela played a major role in the fight against racial discrimination in South Africa. ➯ Nelson Mandela was born on 18 July 1918 in Eastern Cape province of South Africa. ➯ Nelson's father Gadla Henry Mphakanyiswa Mandela was a councilor to the Emperor. ➯ Nelson Mandela completed his B.A degree from Johannesburg. ➯ Nelson Mandela joined the African National Congress in 1944 and later became the President of its Youth wing. ➯ Nelson Mandela was arrested and sentenced to jail term during the famous Treason Trial, in 1956. ➯ In early 1960s Nelson Mandela was again arrested, for violating restraining orders and released in 1988. ➯ In 1994, Nelson Mandela was elected President, during the first Democratic elections. ➯ Nelson Mandela married thrice, his last wife being Graça Machel. ➯ "The greatest glory in living lies not in never falling, but in rising every time we fall." ➯ "Difficulties break some men but make others. No axe is sharp enough to cut the soul of a sinner who keeps on trying, one armed with the hope that he will rise even in the end". ➯ "Only free men can negotiate; prisoners cannot enter into contracts. Your freedom and mine cannot be separated." ➯ "I never think of the time I have lost. I just carry out a programme because it’s there. It’s mapped out for me." ➯ "It is in the character of growth that we should learn from both pleasant and unpleasant experiences." ➯ "The time for the healing of the wounds has come. ➯ The moment to bridge the chasms that divide us has come. ➯ The time to build is upon us." ➯ "Never, never and never again shall it be that this beautiful land will again experience the oppression of one by another and suffer the indignity of being the skunk of the world. Let freedom reign!" ➯ "Death is something inevitable. When a man has done what he considers to be his duty to his people and his country, he can rest in peace. I believe I have made that effort and that is, therefore, why I will sleep for the eternity."